There's been a lot of character reveals for Vagrus - The Riven Realms on our website and our social media since we began posting about a year ago. We figured it behooves us to talk a little more about who these characters are and what their role is in the game. The vast majority of the characters you see revealed are enemy characters, even if sometimes they can be allies in the game for short periods of time (or versions of them, anyways). 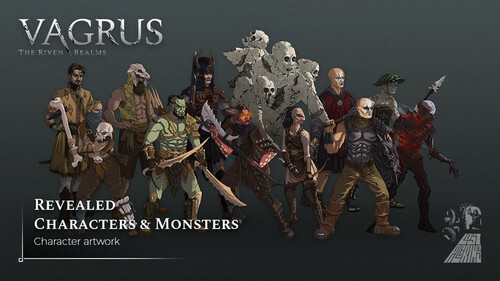 Although Events involve these enemy characters often, you will mainly see them as shown in the artwork in turn-based combat. All of them have their unique combat skills and synergies with other enemies. They can fight for you in combat. Each of them have combat skills that you can use to defeat your enemies. Their stats and skills can be upgraded using your own Insight to level up the Companion. With each level up, you can give them new perks and improve their combat skills. Each companion has their own personal storyline you can follow. These stories can go in different directions, eventually upgrading the companion and driving the overall narrative. You can also talk to them at camp and learn more about them, their goals, dreams, past, and so on. Companions can also fill special roles in the comitatus, becoming what we call Deputies. Essentially, Deputies are your officers and most trusted traveling companions. Each of these positions can be filled by a single available Companion and the filled position provides you with passive and active boons. For example, having a Companion as a Scout Master gives you bonuses to Movement Points, raises the chances of successful scouting and improves the quality of information gathered from scouting. Each Companion and Deputy position also allows you additional choices in certain Events you come across, widening your chances to successfully navigate these stories. In the next part of Character Design, we'll talk about how the concept of a given character goes through our design phases to end up as an artwork used in-game. Be sure to check it out!